What better way to end November than with a Thanksgiving recap post? Or half of one, at least! After flying to Florida on Tuesday, Wednesday was Thanksgiving prep day, but before that I got up early and ran 5 miles around the neighborhood. Being out of town was no excuse to let my marathon training slide. After I showered we ate some homemade egg sandwiches for breakfast and went to the mall for some pre-holiday shopping since we didn’t want to be anywhere near there on Black Friday. I was actually fairly successful. I found a pair of work pants at Loft and a blazer at Limited. On our way home we stopped at Supercuts so I could get a much-needed haircut, and also made a stop at Publix in the same shopping center for the last few required Thanksgiving dinner ingredients. Once we got home the cooking began. First I made some spaghetti for dinner so I could get my carb fix before the turkey trot the next morning. Then my mom and I assembled the ginger-coconut pumpkin pie and baked some sweet potatoes for a casserole recipe I found in Cooking Light. And while watching “A Charlie Brown Thanksgiving” I also made a batch of my favorite cranberry sauce recipe. On Thanksgiving morning we all got up early to go to the Tallahassee Turkey Trot. I was running the 15K while my mom and her friends walked the 5K and my saintly dad waited for all of us at the finish line. It was a warm morning (the race didn’t start until 8:45 AM) and the 15K course was hillier than I expected so it wasn’t an easy run. My time was acceptable (for me), but it was challenging. I’m still glad I did it. Since it was week # 12 of my marathon training plan I was supposed to do an 8-mile mid-week run, so a 9.3 mile race fit very nicely. One the way home was stopped at the first open McDonald’s we could find and had Egg McMuffins for a late breakfast. The perfect post-race meal. Cooking started in earnest once we got home and got cleaned up. And of course we watched the Macy’s Thanksgiving Day Parade while we prepped for the big meal. Thanksgiving dinner was absolutely delicious (see our complete menu here). We tried several new recipes this year and most of them were a success. Some could use a few tweaks, like the sweet potato casserole, so I’ll keep that in mind for next year. 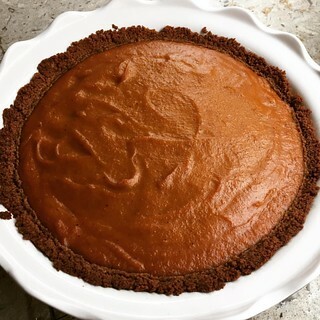 One recipe that is a definitely keeper (with no changes) was the ginger-coconut pumpkin pie. It was by far the best pumpkin pie I’ve ever tasted, so I have a feeling that one will become a holiday tradition in my family. I love technology. How else could I have written and published a blog post while on an airplane today? 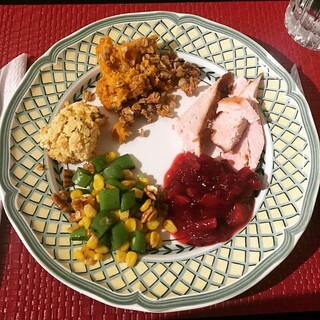 I also found some potential Thanksgiving vegetable recipes and emailed them to my mom, as well as chatted with some friends on Facebook Messenger. It’s truly amazing. I’m anxiously awaiting the day when inflight wifi has enough bandwidth to stream Netflix and Amazon Prime content. That will make traveling infinitely more entertaining. 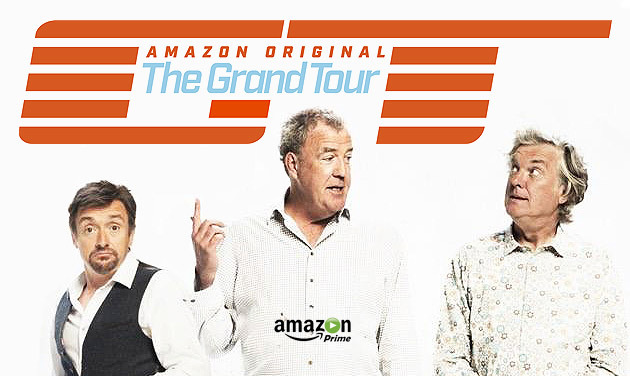 Speaking of Amazon Prime, I am hoping to have a chance to watch the first episode of “The Grand Tour,” the new motoring show with Jeremy Clarkson, Richard Hammond, and James May, while I’m in Tallahassee. I’ve been looking forward to it for months. In a similar vein, Run Disney published the registration dates for all of their late 2017 through early 2018 races this morning and everyone is a bit baffled. Usually registration for these races opens around seven or eight months before the race date. And you usually have to sign up immediately since you never know how quickly a race will sell out. (It varies from within 30 minutes to never, and it’s impossible to predict.) However, it looks like the lead time for upcoming Run Disney races has increased to nine or ten months now. In fact, my friends and I have to register for the Disneyland Half Marathon Weekend in about two weeks! So much for waiting to recoup some of my holiday spending before giving hundreds of dollars to the Disney Corporation. Speaking of giving money to Disney (one of my favorite pastimes), the other day I got wind of an email that had supposedly been sent to all of the 2016 Avengers Half Marathon Weekend participants inviting them to pre-register for next year at a discount. This is unheard of for Run Disney! My biggest gripe is that even as an incredibly loyal participant who ran all three Avengers races in 2016 I didn’t receive this fabled email! With a desire to maintain my legacy status for the fourth year I would most definitely jump at the chance to sign up for 2017 now before the official registration begins. But for some reason I was left off that particular mailing list. I was so disappointed! Luckily one of the members of my Galloway running group was kind enough to share the link with me today so I should be able to pre-register after all. Thank goodness for understanding runner friends! I have now finished watching the first episode of “The Grand Tour” and it was amazing! I was only able to watch the first half of it while I was in Florida because I had to get my parent’s TV to connect to Amazon Prime first. This required ordering a Roku streaming stick which only arrived on Saturday afternoon. Also, I did successfully sign up for the 2017 Avengers Half Marathon Weekend last Tuesday so that’s one Disney race registration that I have out of the way. The Disneyland Half Marathon Weekend registration is coming up next Thursday so I’m going to have one hefty credit card bill coming in December! On my flight from Dallas to Los Angeles yesterday I started sneezing. I dismissed the first few sneezes as simply caused by dust or irritation, but after several more I started to think I was getting sick. That theory was confirmed when the sneezing continued, followed by some nasal congestion, after I got home from the airport. So I ended up taking a today day off from work to avoid sneezing all over my co-workers. Such an inauspicious end to the Thanksgiving holiday! I was hoping that spending the day at home recuperating would give me ample opportunity to write an extensive webpage post about Thanksgiving. Unfortunately that didn’t happen. First of all, I ended up sleeping until 10 AM. I can’t remember that last time I did that. Obviously illness and jet lag took their toll on my body. And then when I woke up I remembered that my kitchen was lacking in a few basic staples that I needed this week, so threw on some clothes and went to the grocery store. When I was back at home I curled up on my couch with my laptop intending to do some writing, but I got distracted. Not only did I have a wealth of TV shows and movies on my DVR to watch, but it’s Cyber Monday so there were a lot of websites I had to visit to discover what deals were available today. So I spent the better part of the day watching episodes of “Arrow” and “Legends of Tomorrow” (interspersed with FXX’s “The Simpsons” marathon), and placing orders for everything from running clothes to sunscreen. The Cyber Monday sales saved me a lot of money so I’m happy about that. Eventually I ran out of excuses so I started writing this post. It’s fairly pathetic given all the free time I had today, but it will have to do. I still have several chores I need to do tonight so that I’ll be prepared for tomorrow. This cold is mild enough that I’m confident that I can go to work tomorrow. At least it won’t be another wasted day! I didn’t update my webpage yesterday. I was doing so well leading up to Thanksgiving, but things started to unravel as the November holiday celebrations ramped up. The quality of my posts on Thursday and Friday were already questionable (I was hoping I wouldn’t have to resort to a wordless post during NaBloPoMo, but Thanksgiving and Black Friday crumbled my resolve), and then yesterday I had zero time or energy to put anything even second-rate together to keep my NaBloPoMo streak alive. I’m disappointed that I failed in my endeavor, but I sacrificed that success in order to spend time with my family before leaving town. In the end that was more important than my crazy annual writing challenge. And then today I intended to spend a lot of my travel time today composing a longer post about my Thanksgiving vacation, but that didn’t happen. My flight left Tallahassee this morning at 6:12 AM, and that was after getting home around midnight after the UF vs. FSU football game last night. Needless to say, I got very little sleep. (When my alarm went off at 4 AM this morning I was fast asleep and having a ridiculous dream about a made-for-TV Christmas movie that got terrible ratings and ruined the career of the lead actor. I guess I watch too many Hallmark Channel holiday movies.) I spent the entirety of my first flight dozing off and on, but I only felt slightly more rested when I arrived in Dallas. This meant that my brain wasn’t in any fit state to formulate a webpage post during my unfortunate four-hour layover at DFW. (Standby wasn’t an option on the Sunday after Thanksgiving when apparently everyone in the US was trying to get to Los Angeles.) What a waste of perfectly good down time. When I finally got home after my second flight and battling horrific traffic around LAX, I sat down on my comfortable couch, turned on the new episodes of “Gilmore Girls” on Netflix, and I’ve barely moved since then. I’m so tired and jet lagged that writing even this short explanatory post took a Herculean effort. There are only three days left in November, but I’ll do my best to finish up NaBloPoMo on a strong note. But right now I’m going to bed early and hopefully catch up on some sleep before I have to go to work tomorrow! 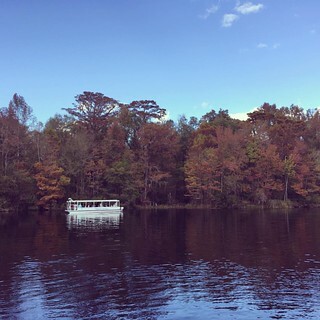 I’m in Tallahassee for Thanksgiving and, as you can tell from the picture above, we’ve had a busy day of important preparations for the holiday tomorrow. With the mediocre results of the Maple, Pumpkin, and Sweet Potato Pie from last Christmas last year, we decided to try something a little different this time. 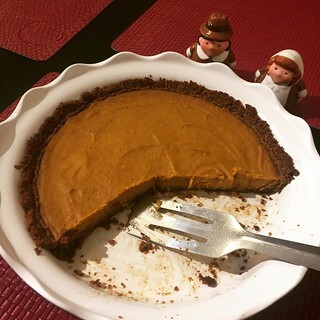 But I’m still determined to make a good pumpkin pie at least once so I wanted something in the same family. I was leafing through a Food Network magazine at the airport earlier this month when I saw a recipe for Ginger-Coconut Pumpkin Pie that looked amazing. And not too complicated either. After reviewing it with my mom we deemed it worth of a Thanksgiving dessert. So today when we got back from some day-before-Thanksgiving shopping and errands we started preparing the pie. And as you can see in the photo, it came out of the oven looking really beautiful (whipped cream topping not shown as we haven’t made it yet). And if it tastes half as good as it smells then we’re in for a real treat to end our Thanksgiving dinner. Since I haven’t actually had a slice yet I can’t tell you how it tastes, but I will report back tomorrow with the verdict. I’m excited! I’m on a plane to Miami right now where I’ll catch my flight to Tallahassee this afternoon. I paid for extra leg room this time around (worth it for nearly five hours between LA and Miami) so using my laptop is a breeze! Also, there’s an empty seat next to me so I don’t feel like anyone is looking at my screen while I type. I figured I’d take this time to finally write a post about a races from earlier this year that changed the way I run. It was a big deal! In May of 2015 I was registered for the Orange County half marathon, but ended up skipping it because I was still recovering from my knee injury earlier in the year. Of course I managed to get hurt again in early 2016, but much to my delight I was healthy enough to run the OC half marathon this year. 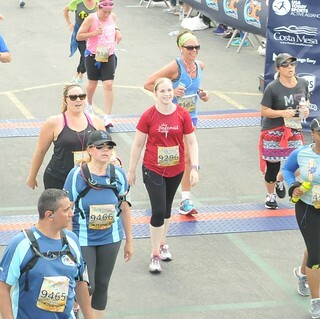 However, I was pretty out of shape when the race rolled around in May. So in order to keep from being completely bored on the course for three hours I decided to run with one of my co-workers and her sister-in-law. They had modest expectations for their finish time so I figured I wouldn’t be holding them back. This was my first introduction to the Galloway Run/Walk/Run Method. Previously I only took short walk breaks about every mile, but that particular strategy broke down after the first seven or eight miles when I couldn’t run a full mile at a time anymore. That made the rest of the race pretty frustrating. But using the Galloway Method during the OC half marathon the other ladies and I ran for 1 min 15 sec and then walked for 40 seconds, repeating those intervals for the whole 13.1 miles. (Mostly. There were a couple of monster hills that we broke down and walked all the way to the top!) This approach to running was completely new to me and it took a while to get used to. Taking a walk break after only running a little over a minute felt really strange at the beginning of the race, but as the miles passed I was amazed at how well the Galloway Method was working for me. I didn’t hit the wall at mile 10 like I usually did during a half marathon, and after we crossed the finish line I actually still had some energy left which, for me, is unheard of. It was a remarkable outcome. My finish time wasn’t anything to be proud of, but I didn’t care. After that day I was resolved to buy an internal timer and join my co-worker’s Galloway running group. I loved it that much! It’s been over five months since then and now I use the run/walk/run method exclusively for my races and other long runs. Like my highly successful 16 mile run last Saturday. 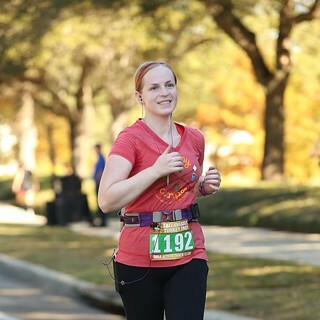 I know the Galloway method isn’t right for everyone, but it has worked wonders for me so I’m glad I got the opportunity to try it during the OC half marathon. The course was really beautiful too so I’m looking forward to running it again in 2017. As a side note, there was one particularly funny moment before the race even started. After getting on the bus from the fairgrounds parking lot to the start line I realized that I hadn’t put any sunscreen on my legs! I slathered it on my arms in the parking lot, but I had completely neglected my legs below the hem of my running capris. So once I got to the start line I started searching through the crowd, looking for someone who might have sunscreen in their bag of supplies that I could borrow. I probably looked creepy, but I was desperate! It took a while, but I finally found someone who had a bottle of sunscreen out and was willing to let me use some. Bless that kind stranger! I would have had lobster legs otherwise! Today was supposed to be a quiet day. I had originally planned to get up early and go running before work to get some of my weekly miles out of the way, but it was still raining when my alarm went off this morning. A lovely and much-needed rain storm swept through Los Angeles overnight and it hadn’t quite cleared out by 5 AM. A pre-dawn run in the rain was definitely not going to happen so I went back to sleep for another glorious hour. I had my annual health screening at 7:30 AM, but I didn’t give myself quite enough time to find the right location (a conference room in a different building) after I arrived at work. I was a bit late and slightly sweaty when I got there. It was the wrong day to wear a fleece jacket! Luckily all of the numbers from my blood work turned out really well. Who’d have thought diet and exercise were good for your health? Ha ha! At least I got my screening done for the year. One less thing to worry about in 2016! It was my last day of work before the Thanksgiving holiday and I was expecting light attendance at the office. And it was indeed lighter than usual for a typical Monday, but that didn’t mean things didn’t go awry. On a whim I dialed into a meeting at 11 AM only to discover that our schedule for January and February was being completely reworked and one of my events was being moved up three weeks! No one had even invited me to the conversation (the meeting itinerary didn’t include this topic) and I’m getting three fewer weeks to prepare for an activity that I’m responsible for. What the heck? It doesn’t help that I essentially have four different high-profile events in the first two months of 2017. Doesn’t that sound like fun? It took the rest of the day, but by the time I left work at 5 PM we had settled on a new scope and lower expectations for the revised schedule that would be easier to meet. I’m still not happy about it, but I think it’s at least doable. After all that craziness I drove home and started packing for my trip to Tallahassee for Thanksgiving tomorrow. Nothing like waiting until the last minute! I also ran four miles tonight so that I don’t have to worry about getting no exercise tomorrow due to sitting in airports and on planes all day. Hopefully I’ll have time to write something more substantial that this short little post. Unfortunately I need to finish packing and go to bed right now because I have to drive to LAX way too early tomorrow morning. Happy Monday before Thanksgiving, everyone! It’s the Sunday before Thanksgiving and instead of being responsible and productive I did something completely frivolous – I spent the day at Disneyland! I went with my good friend Natalie and we had an incredible time. The theme of our trip was Tower of Terror since the ride in its current incarnation is closing on January 2nd. Since Disney announced that they are converting the building into a “Guardians of the Galaxy” attraction in 2017 the responses have been mixed. While Disneyland is always changing in on way or another (like the ongoing construction of Star Wars Land that’s supposed to open next year) it’s a little sad to see such a unique landmark be completely overhauled. Due to the imminent shuttering of the Hollywood Tower Hotel it has become the most popular ride in the parks with long lines and quickly disappearing Fast Passes. When I was there last weekend the wait time was 150 minutes! Yikes. 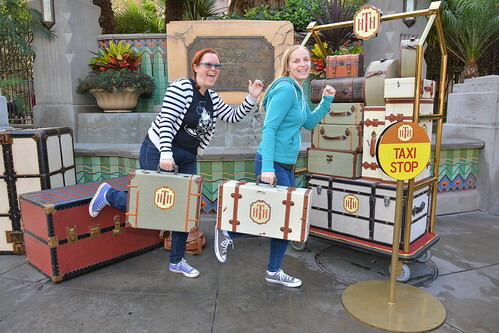 So in order to make sure we got on Tower of Terror without spending hours in line, Natalie and I headed directly there as soon as California Adventure opened for the day. That was what we’ll call ToT #1, and it was amazing. After our first experience we walked across the street and got Fast Passes that we could use an hour later. After some coffee, hot chocolate, and a little shopping we made use of the FPs – that was ToT #2. We were lucky enough to be in the front row that time and the photo that’s taken on the ride turned out great. You’d think two times through Tower of Terror within an hour and a half would be enough for us, but you’d be wrong! Upon exiting we got another set of FPs for a little later in the morning. While waiting to use those we made our way over to Disneyland and got Fast Passes for Hyperspace Mountain, my favorite. But then it was time to get back to California Adventure for ToT #3. After walking out that third time we figured there was no use tinkering with a successful formula and so we picked up a third set of FPs for the afternoon! At that point it was time for a delicious lunch at Carthay Circle and then Hyperspace Mountain over in Disneyland. Due to crowds and a little rain we almost didn’t use our last Tower of Terror Fast Passes, but there were some Christmas presents that needed to be purchased in California Adventure so there was no use letting them go to waste! That was ToT #4 – our final check-out. I’m not happy about it, but I’ll be content if I don’t find my way to the Hollywood Tower Hotel again before January 2nd. 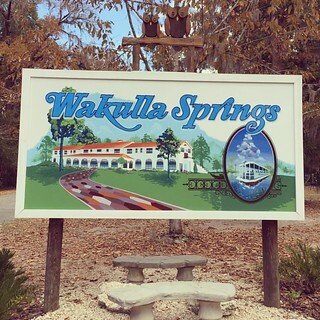 Thanks for all the great memories! Photos from all four ToT experiences will be available in my Disneyland 11/20/16 photo album once I am able to download them from the Disneyland PhotoPass website!